Today, a long-time friend emailed me the link to YouTube Play: A Biennial of Creative Video. many aspiring artists. YouTube Play will recognize the current effect of new technologies on creativity by showcasing exceptional talent working in the ever-expanding realm of digital media. But after viewing the video, I realized the YouTube spokesperson was a Google Creative Director (they own YouTube after all), not a YouTube Creative Director. 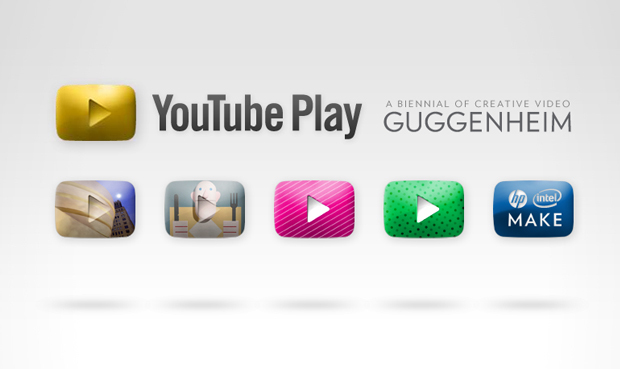 So, we have three entities: YouTube, the Guggenheim, and Google. How’s that for diversity? OK, their assets are definitely representative of their own distinct cultures. This much diversity might send some creative types running to a nearby mountain to mediate on anything but this. But I found this refreshingly challenging. Letting my imagination run wild, I thought, “Shouldn’t this project and its branding reflect the P-L-A-Y factor a bit more?” I mean look at the Web page above for the Guggenheim? Not exactly p-l-a-y. Okay, better. Fairly corporate. But, does it truly reflect P-L-A-Y? And the idea of what’s next? I don’t think so. So with this gnawing at me, I decided to take my own stab at this fascinating partnership. The visual assets are at opposite ends of the universe, not just the galaxy. So, how to bring it all home? DISCLAIMER: THE FOLLOWING VISUAL PRESENTATION IS DESIGNED FOR MATURE AUDIENCES ONLY…. MATURE AUDIENCES WHO LOVE WORK AT PLAY, AND PLAY AT WORK. The above design is my own fascination allowed to wander. It is not commissioned by Google, YouTube, or the Guggenheim, but if they request it, I will turn this into a video and submit it by their July 31st deadline.